Last year's unexpected hit franchise is here to stay, and it's not slowing down one bit. With multiple versions of Skylanders already on the market for home consoles, the 3DS, and even smartphones and tablets, you may already be feeling worn out on the franchise. But don't worry, Activision is confident that you're not going to get sick of the lovable Skylanders universe any time soon - even with two new titles on the horizon. "If this was simply a matter of porting the games, we could risk brand saturation or overexposure," says Activision Mobile VP Greg Canessa. "But I think by creating those complimentary experiences, I like to think of it as more fleshing out of the world and creating different experiences on different devices." 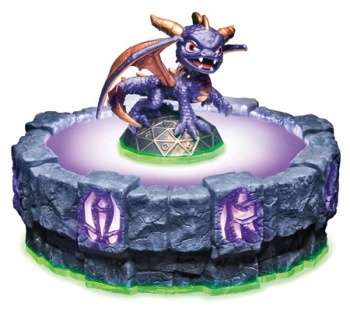 The original Skylanders: Spyro's Adventure debuted last year for the PlayStation 3, Xbox 360, Wii, Nintendo 3DS, and PC. Skylanders Giants hit store shelves last week on those same platforms, with the Wii U iteration set to launch alongside the new console on November 18th. Skylanders Cloud Patrol is also currently available for iOS and Android devices, and Skylanders Battlegrounds and Skylanders Lost Islands - two new titles for the iPad and iPhone - were recently announced as well. Oh, and let's not forget the Skylanders ebooks and rumored film and/or TV series that Activision claims may happen somewhere down the road. Activision may have struck gold with the original title, which sold well above even its own expectations, but will the magic last? We likely won't have to wait long to find out.